Four NVivo 9 tips to save you from trouble, and one from worry. Written to save NVivo 9 users some trouble and worries. 1. Work on your files locally, not via a network. Although I was told this at an NVivo workshop last year, I proceeded to ignore it as working off a project file from the local area network folder seemed not to present any problems; it was responsive and saved me the time of backing up from my local drive. That was all good-and-well until I lost a whole day's work, because the file became corrupt! What caused this, I do not know: I suspect an automated Time Machine backup ran and NVivo subsequently froze. After restarting it, the file would not open and viewing the file's information showed it had shifted from being 180 MB big to 0 KB; not a good sign :(. I now only work locally and backup to the LAN at the end of each workday. Although this means adding an extra few minutes to my schedule, I can be confident of not losing nine hours! 2. If you work via a network, you can also expect big problems if you shut down your computer without closing NVivo properly. 3. Set all automated tasks to run outside your NVivo sessions. I ensure that all the computers' backups and software updates (PC and Mac) either run outside my work hours or must be manually activated. I do not run more than three software packages simultaneously. I run NVivo in full screen (not Coherence) mode in Parallels almost all the time, so there's no temptation to run several Mac and PC applications simultaneously. Not only does this ensure optimal performance of NVivo on my local setup, it also prevents interference with NVivo's ability to save project files, which is a very good thing! 4. Save a new version of your file each day. It's a good practice to change your filename for each day. In my case, I simply change the daily date I type in the filename; i.e. "17 Mar 2012 ICT Access and Use UCT". I then backup the file to the relevant project month folder on the network. This ensures that I have the a backup record and can easily show the progress on the work I'm paid by the hour to do. It is also useful when working with other people on the same project file; for example, being a fallback just in case certain attributes are not imported. 5. Don't be afraid to import many, large video files as internal source. If you want full coding functionality, you should always import files as internal sources, not as externals. Originally, I thought that importing a file as internal source automatically meant that the video was saved into the NVivo file itself. So, I thought I must limit myself to only importing the most interesting videos as internal source. 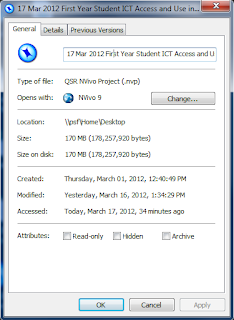 However, through experimentation, I soon learnt that one could use the 62-bit version to import files much larger than NVivo 9's guidelines stated AND many of them (see the screengrab below), without the project file's size growing substantially. The NVivo file above is just 170 MB in size; you don't have to take my word for it, see below. As long as the location of the source video remains the same, there are no issues. Now, since the maximum file size of an NVivo project is reportedly 2 GB, I can add many, many more video interviews as internal source. So, with a nod to QSR International's Australian pedigree, it's a happy case of "No worries, mate!" So, those are the most important tips I have learnt and if you have other ones to share, feel free to submit them via the comments box below, thanks. I also experienced an annoying problem with Nvivo as well when working with my Nvivo project from my local dropbox folder on my mac using Parallels. The file path would be Z://dropbox/nvivoprojects. When saving, the changes to the Nvivo file would not be committed to the local mac drive until after closing Nvivo, which meant no running backup using Dropbox as well! !